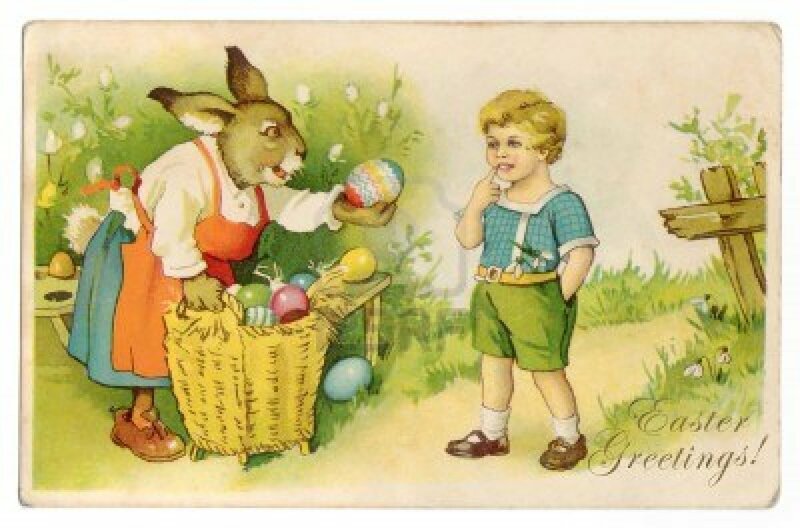 In Germany, they make a really big fuss around Easter; many homes hang little Easter eggs in their trees and gardens, and sending cards seems to be the thing to do. 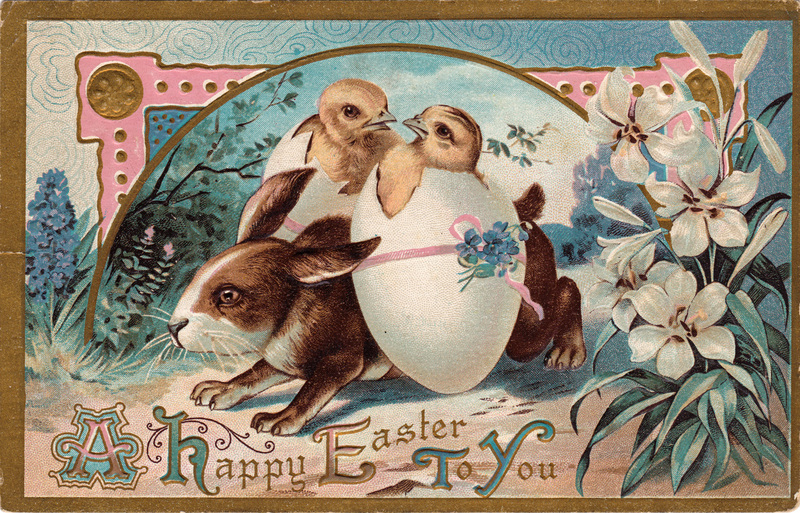 I don’t think I’ve ever sent an Easter card before, but it’s an excuse to get creative.Around each holiday or festival day, I love searching out vintage images associated with the event. My Halloween post is a popular one each year, so presumably I’m not alone in finding these sorts of things fascinating. 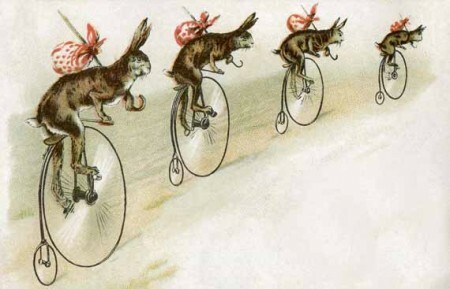 Anyway, I realised as I was searching for some pictorial inspiration just how creepy some of these images are, particularly the Victorian ones. 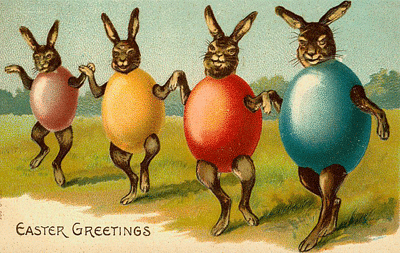 Don’t ever accept eggs from strange rabbits. 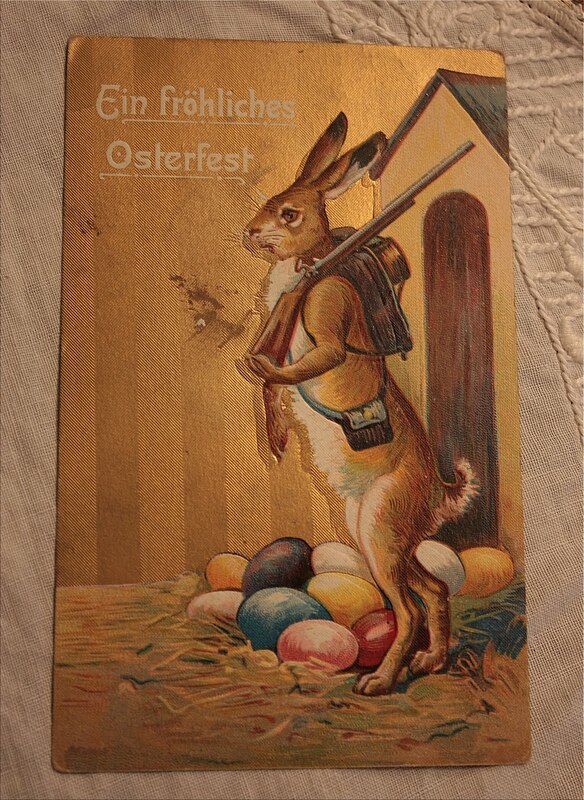 Translating as, “A Happy Easter” yep, it’s that classic image of a rabbit guarding his eggs with a gun. And standing on its back legs. 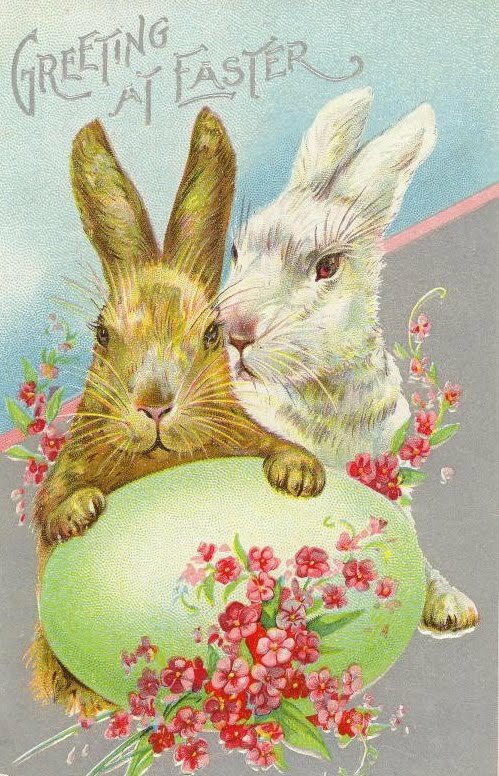 Just be warned, I think this one might possibly be the real Easter Bunny. 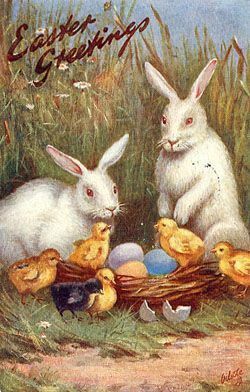 He doesn’t give up those eggs willingly. 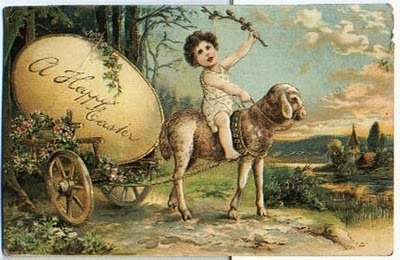 Man-faced baby riding a sheep, pulling a giant egg. Mainly included for that man-face… I’m pretty sure he’s whipping that sheep, too. 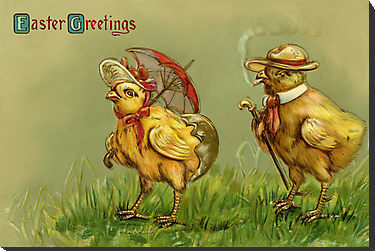 Nothing says Easter like a smoking, suited chick. 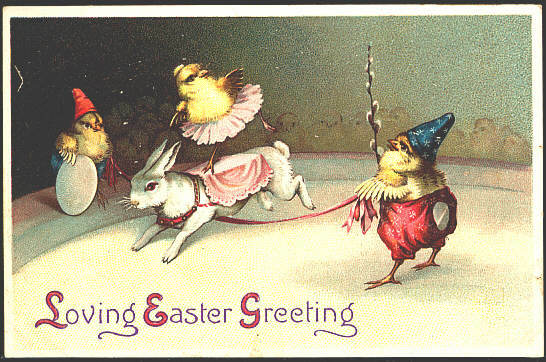 And just why, oh why is the wife still wearing part of her egg? Does that mean she’s not long hatched and there’s a bit of sugar-daddery going on here too? 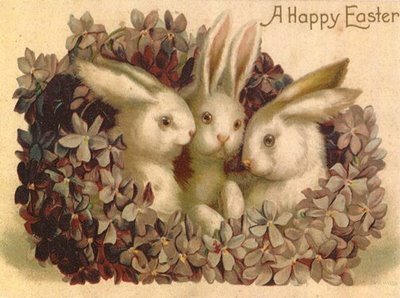 I’m christening it: “Dead eyed rabbit serves as transportation.” These poor rabbits. Don’t they ever get a rest from their stony-countenanced chicken circus masters? Oh, there you go. 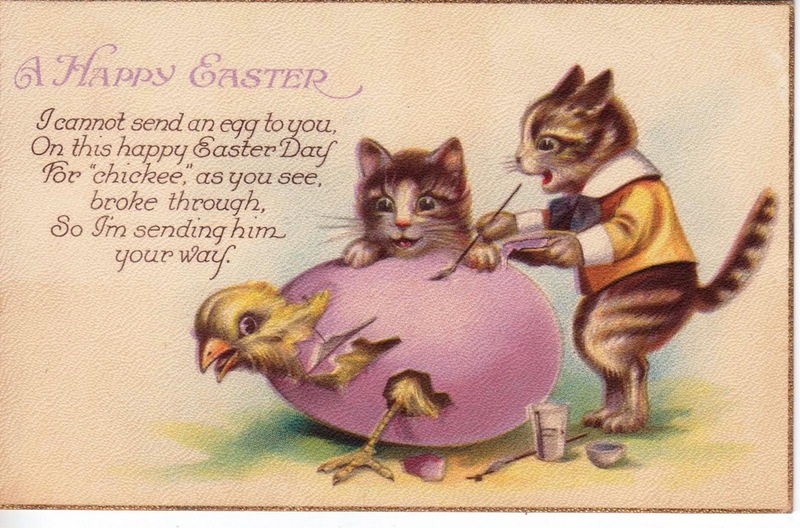 Revenge enacted by that other popular Easter symbol… er, the painting kitten. This pair look like they’re about to eat this chick. Not if the elves get there first though… this one never stood a chance. 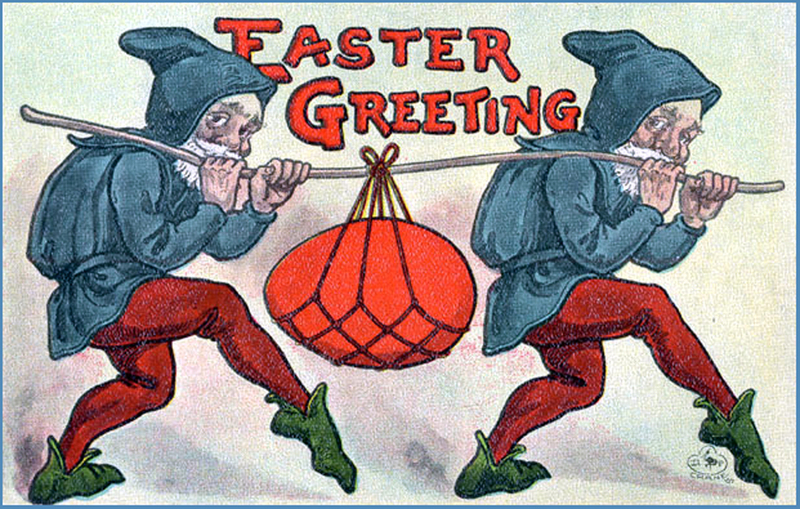 Actually, these elves/gnomes are really creeping me out. 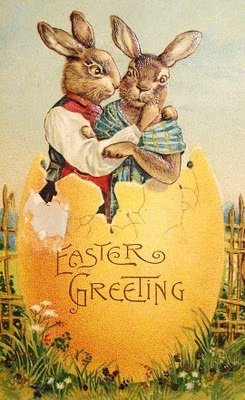 If someone sent me one of these, I don’t think I’d be able to put the cards up. 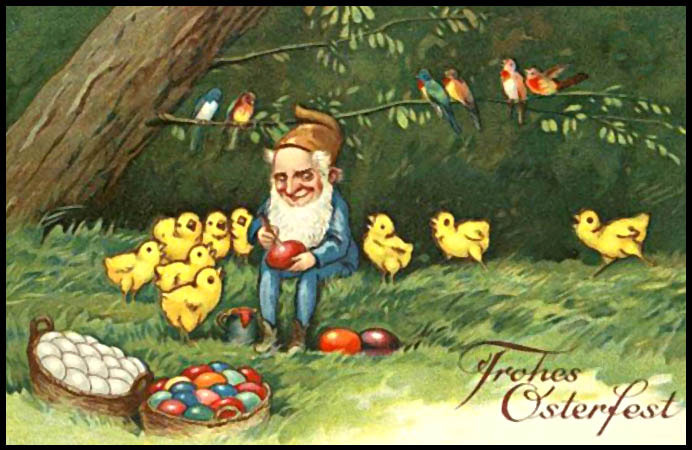 He draws them in with his promises of painted eggs, but look at him eyeing that chick up to the right. It’s a goner. 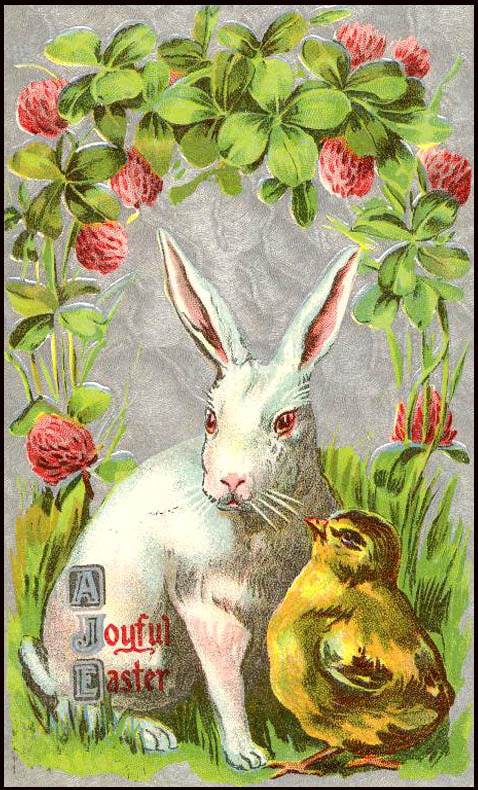 For some more creepy Easter cards and a lovely bit of information about the origins of the Easter cards, visit here. Previous Post Was Maria Felix the Inspiration for H. Walter’s Ilonka?